3D printing technology is still in its infancy. However, like many other technologies before it, it could soon develop into a widespread production technology. This would also have a serious impact on international trade. 3D Printing Technology – What is it all about? 3D printers are used to fuse plastics, metals and other raw materials into new objects. The 3D printing process is a so-called additive production process that joins materials in layers. This means that only the material input is used, all of which ultimately flows into the manufactured product, without any waste. The current production processes, on the other hand, are subtractive manufacturing processes. This means that the required materials are cut and processed (milling, grinding, filing, etc. ), which results in the loss of material which rarely can be reused. 3D printing technology therefore leads to a considerable reduction in material waste. This means increased productivity and lower prices for the products manufactured. Parts made using a 3D printer are also often more durable and lightweight than traditionally produced parts. For example, a component made with a 3D printer of a shock absorber used in Formula 1 is twice as durable and at least three times more durable than its predecessor (cf. Rosenbach 2016: 78). Although this technology is still at the beginning of its development, numerous products are already being manufactured with it. Not only individual parts are produced, but increasingly also final products. Examples are furniture, protheses, machine, aircraft and car parts and even entire automobiles and prefabricated house parts (see Rifkin 2014: 134-149, Ehrlich et al 2015: 34). 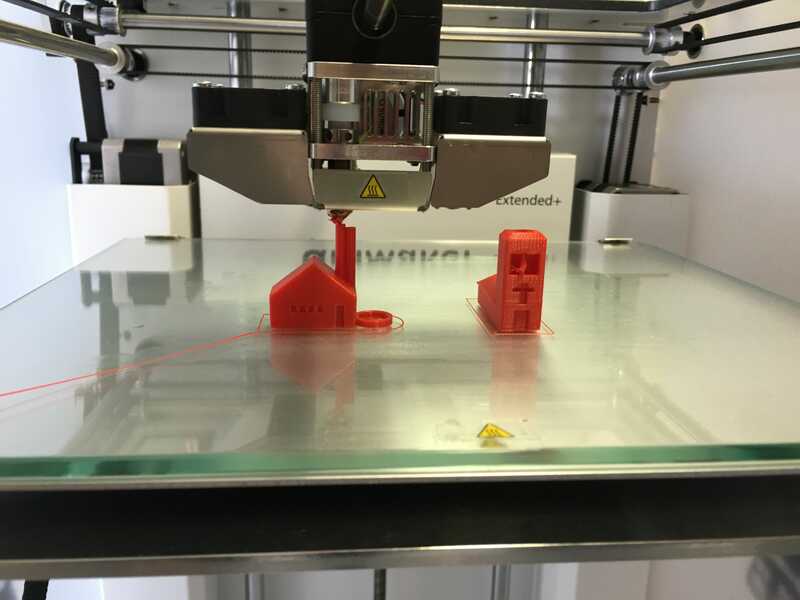 Currently, 3D printers are mainly used in the plastics industry as well as in mechanical and plant engineering, the automotive industry and the aviation industry (cf. Müller and Karevska 2016: 6). Typically, these are objects produced in small batches or with a high degree of customisation where they currently have the highest utility. In the past, the costs associated with the introduction and use of new technologies in industrial production have decreased considerably over time. In perspective, it is therefore quite plausible that technological development makes the use of 3D printers also attractive for mass production (cf. Ehrlich et al 2015: 34). If this should actually happen, world trade will change considerably. In my view, the following five theses could significantly shape these changes. The increased use of 3D printers in production means that human labour is replaced by capital and technologies. Low-wage countries are thus losing their international competitiveness. The outsourcing of production processes to these countries is becoming less attractive for advanced industrialized countries. This means that a trend towards insourcing is to be expected in the industrialized countries. This trend is reinforced by the fact that production at the consumer’s location saves transport costs. This concerns both the transport of the final products to the consumer and the previous transport of individual parts and preliminary work to the production site. Both developments are likely to lead to an increase in the entire production of consumer goods where consumers live. From the point of view of the industrialized countries, there will be insourcing and, from a global perspective, a stronger regionalization of production. The regionalization of production has reduced the importance of imported inputs. Individual parts are no longer produced by suppliers from abroad, but with the help of 3D printing technology at the place of production. This is cheaper (because material consumption is lower and transport costs are eliminated), faster (because transport routes are saved) and more flexible (because product-specific features can be addressed immediately). As products are increasingly manufactured at the place of consumption, international trade in final products declines. As a result, the worldwide export volume of these products is falling. The same applies to primary products and individual parts, which are also produced at the place of consumption. The production technology properties of 3D printing technology outlined above will result in an increase in cross-border trade in all basic and raw materials required for production with 3D printers. Industrialized countries such as Germany, which are particularly poor in raw materials, have to import more raw materials. Overall, however, I believe that global trade volume will decline because the consumption of raw materials in the additive production process of 3D printers is much lower than in the traditional subtractive process. In addition, the reject volume of 3D printing technology is extremely low. As a result, the increase in exports of raw materials cannot compensate for the decline in exports of primary and final products. The worldwide trading volume is thus decreasing. From an ecological point of view, this is a positive development: less global trade means less energy consumption. This reduces environmental pollution. The decline in cross-border trade in intermediate and final products does not mean that companies can no longer sell their products abroad. This can still happen. However, companies will then manufacture a large proportion of their products using 3D printing technology in the country where they sell these products. To achieve this, it is necessary to build up the corresponding production capacities. This leads to foreign direct investment. Foreign direct investment will therefore increase significantly in the future. 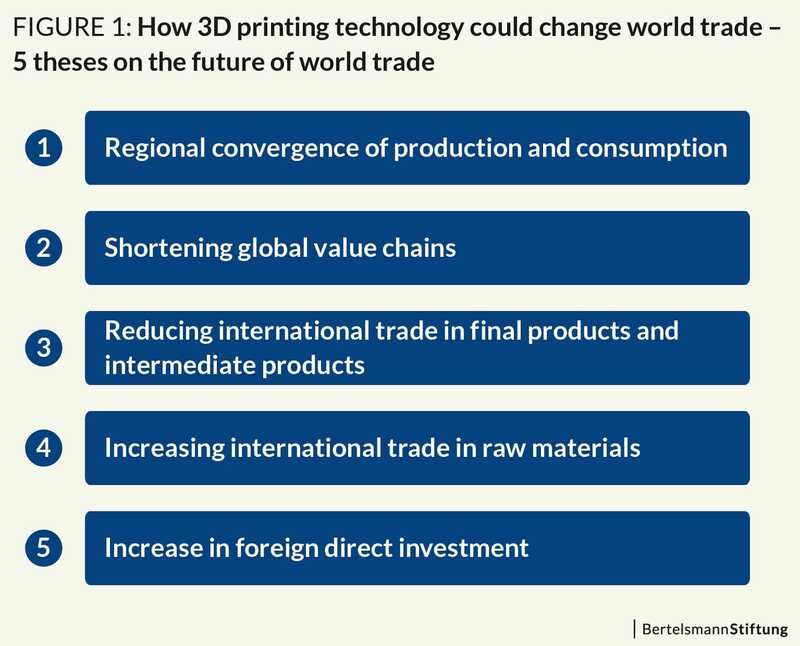 These five theses on the future of global trade against the background of the growing importance of 3D printing technology are associated with a high degree of uncertainty. Above all, it is unclear how quickly the developments I expect will take hold and to what extent. The importance of 3D printers for world trade is still negligible. It could therefore take decades before the effects on international trade outlined above become a reality. On the other hand, the speed with which new technologies such as the automobile or the computer have become established has often been underestimated in the past. Therefore, these five theses cannot be completely excluded. Ehrlich, Lars et al. (2015): Strategie 2030 – Digitalökonomie. Hamburg. Müller, Andreas, und Stefana Karevska (2016): How will 3D printing make your company the strongest link in the value chain? – EY’s Global 3D printing Report 2016 (Executive Summary). Mannheim. Rifkin, Jeremy (2014): Die Null Grenzkosten Gesellschaft. Frankfurt/New York. Rosenbach, Marcel (2016): „Revolution aus gebündeltem Licht“. Der Spiegel (26) 2016. 16.7.2016. 78–79. In an article for the “World Economic Forum” in October 2017, Wolfgang Lehmacher and Martin Schwemmer argue that „3D-printing might not kill global trade after all“. In his analysis „3D printing: a threat to global trade“ published in September 2017 (Amsterdam), however, Raoul Leering sees a significant long-term reduction in world trade due to this technology.